Ashot is a famous Armenian artist. He had numerous exhibitions in Armenia and around the world (USA, Europe, Middle East, Russia, etc.). His works are included in public and many private collections. Ashot lives and works in his homeland Sisian. In 1981 graduated from the College of Fine Arts after P. Terlemezyan, Yerevan, Armenia. From 1981-2016 taught fine arts at Children’s Art School of Sisian. The cultural heritage of Ashot’s homeland is a ground for his artistic reflections. Through interpretation and imitation of art from the Neolithic petroglyphs to Middle Age stone grave iconography, the artist seeks for new perspectives of perception of the world. 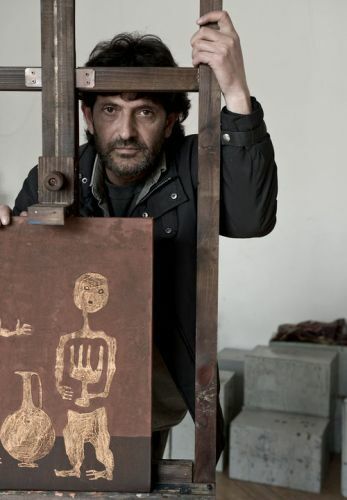 Besides transposing the conceptual and artistic elements of petroglyphs and middle age Armenian iconography to the surface of canvas, he integrates these aspects into performances in an attempt to create a bridge between the past and the present. Please, contact for more information about Ashot's works and persona.